Give The Gift Of Play To Your Family & Friends! 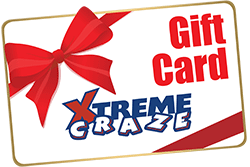 Gift cards to XtremeCraze make the perfect present for birthdays, anniversaries, graduation or just to reward a job well done! Gift cards may be purchased in any amount and used for anything that XtremeCraze offers. Gift cards may not be exchanged for cash or refund. XtremeCraze is not responsible for lost or stolen gift cards. What A Great Idea For Birthdays!